On Saturday, 28 April, 2012, Shirl received a call that she had been dreading. It came from Norma Forand in Florida, who reported the death of her husband, Larry. Larry Forand had been Shirl's music teacher from the time she was nine years old through high school, in Westborough, Massachusetts. Larry and Shirl had a special friendship, and it had grown over the years to involve all of our two families. Larry and Marion, his first wife, lived in Ft. Lauderdale, Florida for most of the years that Shirl and I were raising our four kids . So, Ft. L. became a regular stop on our family's winter vacations. Each time we saw the Forands, we felt as close to them as if we saw them every day. They were good people. Then, in 1989, Marion died of cancer. A few years later, Larry met and married Norma, and she became our new friend. I sometimes thought she was a bit curious about the close relationship between Shirl and Larry, but she came to see that it was nothing she had to worry about. They were simply two simpatico souls with similar values, kind hearts, and a shared sense of humor about the absurdities of the world. Larry has been fading for the past several years, and at 88, his ailments finally took him from us. After receiving Norma's call, which reported that Larry would be buried in the Lake Worth National Cemetery today with full military honors, since he had been in the U.S. Marines in WWII. Larry served on Guadalcanal, and in an aviation support company for the F4U Corsairs of VMF214 ("The Black Sheep Squadron") in the Solomon Islands, under the command of Major Greg "Pappy" Boyington. Shirl and I discussed whether we, or she, should make a trip to be in attendance at the burial ceremony. As I have responsibilities today at the University, and as I had committed to attending a WWII submariner's funeral in Vermont yesterday, Shirl decided to fly down alone, to rent a car, and to attend Larry's service at Lake Worth. Kindly, our friend Alexandra Mutiu volunteered to drive Shirl to the Manchester Airport late Sunday morning for her afternoon flight. So yesterday, I donned my warm jacket (chilly, windy day), and rode to rendezvous with some fellow Patriot Guard Riders (NH PGR) at the McDonald's in Hillsborough, from which we would travel as a group to Bellows Falls, Vermont to stand in a flag line at the Larsen funeral there. 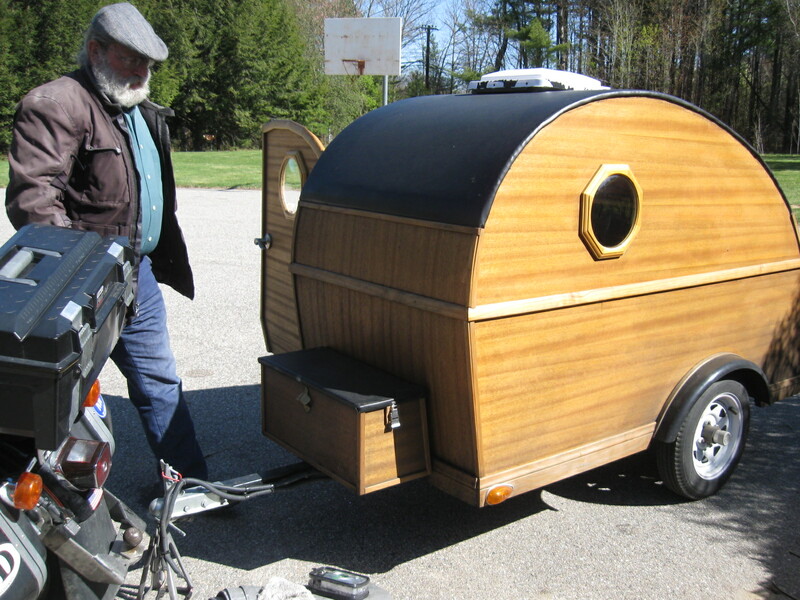 In the parking lot at McDonald's a Harley rider arrived, towing a wooden micro-camper trailer behind his bike. 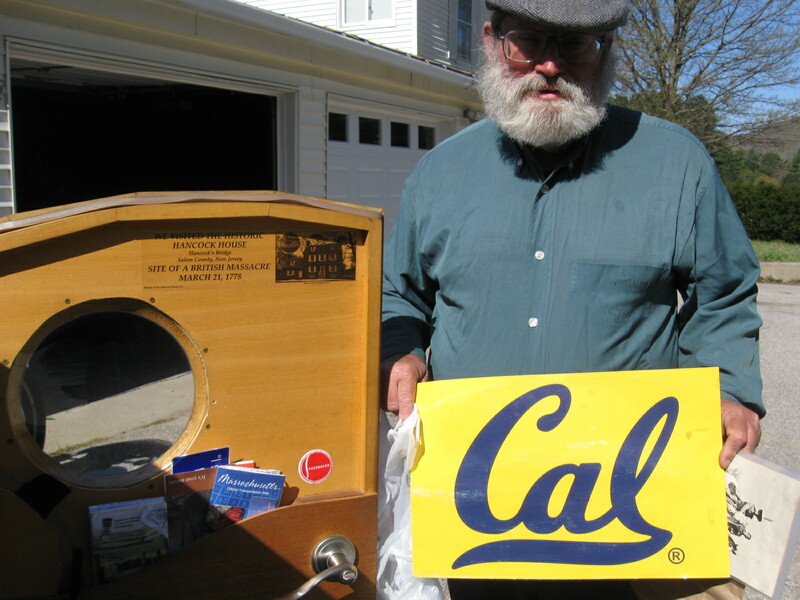 It was a home-designed, self-built rig, and its owner introduced himself as Merlin Bianco of San Francisco. His rig had California license plates, so I invited him to "Hotel New Hampshire" for the night, if he needed a place to "crash," and was willing to ride another two hours north after the funeral. Merlin said, "Is there a shower?" I said, "Of course!" He said, "Then I accept." We rode over to the funeral home in Bellows Falls, about an hour from Hillsborough, and there, in the parking lot, as we were setting up for the flag line, I explained to Merlin that I was "batching it" tonight, since Shirl was on her way to Larry's funeral. I mentioned that Larry was a Marine, and had been in Pappy Boyington's squadron. "Yep," said Merlin, "VMF214. I knew Pappy for the last four years of his life." They had met while both were working airshows on the West Coast. By the way, there is a motorcycle ministry in California called "The Black Sheep Ministry," and Merlin Bianco spent some six years as a lay minister in that organization. Adevarat! Da, da, da, da. Larry Forand was my music instructor in Westborough Ma. for many years in the late 60's and early 70's. Of all of the teachers in my life, he stands out as my favorite. He was an excellent instructor, kind, positive and enthuiastic. The band members thought highly of Larry, and would do anything for him. He always commanded respect, and always gave respect. Larry.... you are in my prayers....thank-you for being a positive influence in my life. You were the best.... a hall of fame teacher. I grew up in Westboro, a small town in Central Massachusetts. In 1960, when I was in 8th grade, the town hired a trumpet player named Larry Forand to be the high school music director. By the time I was a freshman in high school, he had established a marching band, a concert band, a stage band, and a chorus. Initially, the marching band didn't have any uniforms, so we'd wear white shirts and navy blue pants. Money for the uniforms finally came though right before Thanksgiving, just in time for the traditional football game between Westboro and Northboro, neighboring. The unforms were maroon and white, the school's colors, and featured hats with white plumes. We also wore white shoes that we called "white bucks." On Thanksgiving day, Larry had us assemble in uniform in front of the high school's band room. We got in formation and headed to the football field with the drum section cranking out a street beat. As we went up the incline to the football field, Larry called for a roll-off, and the marching band lit into "The Thunderer." By this time, the people in the stands were going berserk. Remember that nobody knew this was going to happen except the parents of the marching band members. Everbody was standing up and cheering, even the fans of the opposing team. For the half-time show, the band performed a routine that we had practiced for weeks: We first formed a "W" (for Westboro) and played the school's fight song for the fans in the stands. Then, one side of the W dropped off so that the W became an "N" for Northboro. The N marched across the field to their grandstand and played a selection for the opposing team's fans. It may sound lame now, but this was one of the proudest moments in my musical career, such as it was back then.